The EPJ-60R is designed to suit a variety of demanding applications. These Rider Pallet Trucks can be customized to suit facility requirements or the needs of a specific application. Built-in diagnostics anticipate service requirements, reducing the risk of unplanned downtime for these high capacity pallet trucks. The WPS manual push walkie stacker is a modern and highly versatile work positioning stacker for all modern material handling needs. Intermediate-duty and with a lift height of up to 150″ (3810mm). The BGS-30 Powered Walkie Stacker is technologically advanced but user-friendly. Built-in productivity enhancements, superior AC power, and a short turning radius for crowded facilities all ensure efficient performance during the most demanding warehouse applications. The BGNR-30 Powered Walkie Reach Stacker combines the tight maneuvering ability of a walkie straddle stacker with the operating flexibility of a counterbalanced truck. A pantograph extends the handled loads beyond the straddle legs and can be retracted for compact turns and tight manuevering. Power steering, side shift, proportional hydraulics, and tilt all result in intuitive control and exceptionally versatile performance. The BGN-40 Powered Walkie Stacker builds upon proven performance standards by incorporating state-of-the art lift truck technology. Its designed and engineered to meet and even exceed the demanding requirements of busy warehouses. The BGL-22 Walkie Counterbalanced Stacker is a cost-effective solution for the stacking and transportation of palletized loads that a straddle stacker or reach truck cannot handle as efficiently. The BGL-33 Walkie Counterbalanced Stacker stacks and transports palletized loads that straddle stackers or reach trucks cannot carry and position as efficiently. A power steering system results in easy and ergonomic vehicle control. Below are major milestones in our Blue Giant history, which outline the company’s ability to identify industry trends and needs and successfully accommodate them. 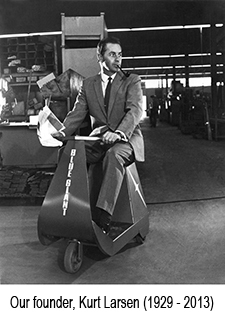 Blue Giant was founded on May 30, 1963 by Kurt Larsen, and quickly became a leading manufacturer of dock levelers and hand pallet trucks. Blue Giant customer base expanded so rapidly that new product offerings (electric pallet trucks and stackers, dock lifts, and scissor lifts) were introduced to supply the growing demand. Licensee partnerships in Australia and South Africa resulted in Blue Giant dominating the market in both countries. Blue Giant primary manufacturing location in Brampton, Ontario, was expanded from 35,000 to 100,000 square feet to handle the large influx of orders. In 1985 the company signaled its future focus on product innovation by introducing the TL85, the first non-impact vehicle restraint, to the North American market. Blue Giant’s global presence expanded with licensee partnerships in Mexico and Southeast Asia. Demand for Blue Giant product resulted in high-volume sales, such as the order placed by the Singapore Port Authority for 309 mechanical dock levelers. On the material handling front, the company redesigned its industrial truck line to include ergonomic handles and a sleeker, more maneuverable body. The new trucks were easier to use and more compatible with tight spaces, making them a standard feature in busy warehouses and logistics centres. The new millennium has witnessed tremendous growth in new product development. In 2001 Blue Giant introduced the XDS Extra Dock Safety Series, the only 2-in-1 interlocked dock system that lowered the risk of forklift run-off and overhead door damage. More innovations rapidly followed: the micro-processor-based Blue Genius™ Touch Control Panel, which revolutionized ‘smart’ control technology; the StrongArm™ SVR303 vehicle restraint, whose patented technology and trusted performance made it a winner in Plant Engineering’s Product of the Year competition in 2009 and the U-Series dock leveler platform, which reduces deck fatigue by enabling a better distributed load. Blue Giant continues to expand its product line and global presence. Stocking locations have been opened all over North America, providing customers with quick and cost-effective access to parts and equipment. In 2011, the company entered into a strategic partnership with Big Lift LLC to exclusively distribute the Big Joe brand of AC-powered industrial trucks in Canada. In 2012, Blue Giant launched the StrongArm™ HVR303 electric vehicle restraint and the Air Cylinder Series, the industry’s first air cylinder dock equipment system. Both products are environmentally sustainable, indicating the company’s ongoing support for green building practices and initiatives. In January Blue Giant launched its U.S. operation, Blue Giant LLC, and opened a new manufacturing facility in Greensboro, North Carolina. This new location focuses on the manufacturing and distribution of the company’s growing line of innovative dock seals and shelters, which includes fixed and inflatable seals, stationary and retractable truck shelters, full access seals, and rain shrouds. In September Blue Giant launched a premium-level Blue Genius™ that incorporates all of the powerful features of the Gold Series, but offers expanded equipment functionality. The momentum has continued throughout 2014. The company Industrial Truck and Aftermarket portfolios have grown thanks to the addition of several exciting new offerings, and in November Blue Giant launched the VL Vertical Storing Dock Leveler, a next-generation model with unique features that add greater levels of safety and versatility to dock operations.